In some cases, you may also have an urgent moment to shrink your video files on Windows. Explicitly, you may have to leave out both header and tail, remove needless blank parts, or cut off the noisy portions from your recording and so on. To release you from this difficulty, a trustworthy video trimming tool is absolutely critical. In this review, you will find 5 video cutters suggested. See what they can do for you now. Joyoshare Video Cutter for Windows is an ideal program well designed for PC users. It has powerful capability to keep your video files organized. Coming with thoughtful timeline and controller, it allows you to trim video on Windows in an accurate way. Likewise, once you import the designated video to Joyoshare Media Cutter for Windows, it will automatically play for you. Namely, it is fairly convenient for you to firmly master each second. Any cutting assignment will be executed at up to 60X faster speed without decoding. In other words, you don't have to worry about the output quality. Moreover, you can get an access to personalize the imported video by customizing its quality, format, volume, size, codec, bitrate, etc. Flexibly as it is, you can produce the finished video in any format or device, such as MP4, M4V, MKV, MOV, WMV, AVI, ASF, OGV, FLV, SWF, HD, or iPhone, Android, game console, smart TVs, etc. Except the main cutting function, it can also be used to combine different portions into a new one and extract audio track from original video seamlessly. Frankly speaking, Media Cope is an all-in-one media tool. You can utilize it to edit photo, convert and play media file. When it acts as a media cutter, it includes full support to multiple formats, for example, MP3, WAV, AAC, WMA, AMR, FLAC, M4A, AC3, RMVB, MP4, 3GP, WMV, MOV, AVI, DIVX, MPG, FLV, MKV and VOB. Comprehensively, you will be glad to see its attentive designs for different features. Briefly, you can change ratio, take screenshots, adjust volume, show playlist, show frame step, overscan, etc. However, the shortcoming is that it renders relatively lower quality files. What's more, if you are a user who runs Windows 10, you have no access to enjoy this smart tool. With an intuitive operating interface, VideoPad makes video-making easier. 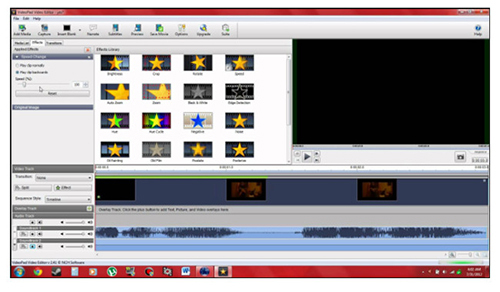 To a great extent, it is not a simple video trimmer Windows tool but a video editing program. It facilitates you to create professional and qualified videos in minutes. You can export your video file to AVI, WMV, MPG, 3GP, MP4, MOV, MKV or iPod, PSP, Android, etc. Furthermore, it has ability to burn video to disc, like DVD, CD, HD-DVD, or Blu-ray. To share it with more friends, you can upload it to Facebook, YouTube or Flickr. There are also plenty of video features provided for you. Specifically, it is available to add text, overlays and effects to 360 degree videos. If you'd like to customize the duration of applied transitions or create visual effects templates to use on any project, this tool can do it for you quickly. To enrich your video, you can speed up, slow down or reverse it when you need. Certainly, it is as well workable to make looped GIF videos. 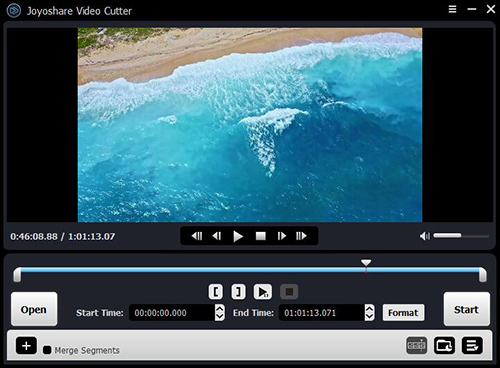 Weeny Free Video Cutter is another proper choice for you. This Windows video trimmer delivers an excellent platform for you to cut large video files into small segments. Any destination videos can be saved as 3GP, AVI, FLV, MP4, MPG, WMV, etc. Even though you are an inexperienced user, you can enjoy yourself in processing your video files with it. 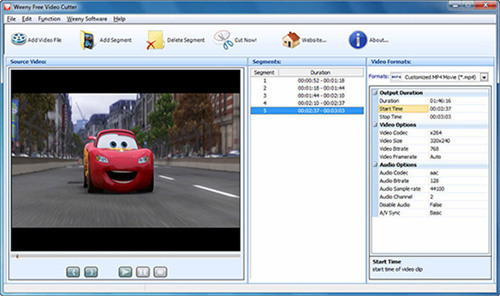 Alternatively, Weeny Free Video Cutter is well developed with a customization function. It offers you capability to modify the videos' order and rename the file. What's more, you can change the video codec, size, frame rate, bitrate and audio quality and so forth as you please. Notably, the blunt slider may prevent you from setting the cutting area precisely. Forthright as Gihosoft Free Video Cutter is, it can be considered as a video cutter assistant for your PC. It is feasible for you to crop unnecessary sections from the original large videos. This hassle-free video cutting program is able to deal with any files in different formats, including MKV, FLV, MOV, AVI, MPEG, MPG, VOB, RM, ASF, WMV, 3GP, DVD or MP4. Most importantly, it gives you compact spin buttons to control every second of your video accurately. Meanwhile, you don't have to worry about the quality as well. No loss will be done on your videos. Sincerely, by means of this video cutter software for Windows, you can do nothing but to cut your videos. All these Windows video trimmer programs are top-notch and widely-used. If you try, you will find that some of them are surprisingly good and can well meet your demands. For newbies, Gihosoft Free Video Cutter is extremely advisable, which can show high efficiency in cutting videos. 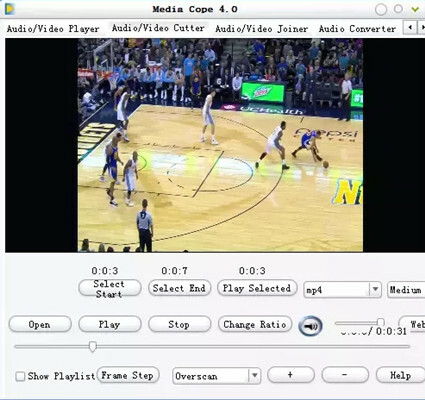 However, for professionals, Media Cope is a superior option, which integrates different functions into one. 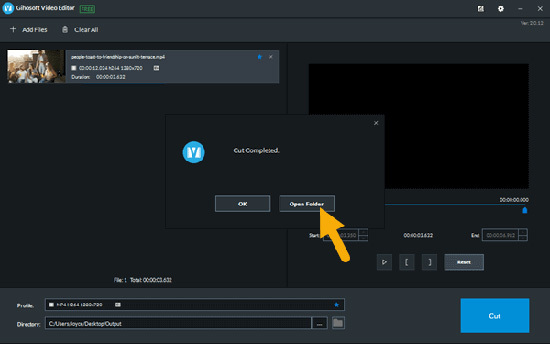 Surely, if you just need a dedicated video cutter, you should grasp this chance to learn Joyoshare Video Cutter for Windows. Top 5 Best iMovie Alternatives, Select One!